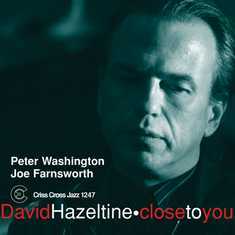 As a member of the hardbop unit One For All and a perennial sideman, David Hazeltine has firmly established his identity as a pianist and composer/arranger of considerable talent. With tried and true partners Peter Washington and Joe Farnsworth on hand,	Hazeltine presents his latest trio set Close To You. Along with a clever new take on the title track originally made famous by The Carpenters, Hazeltine spruces up a great set of standards in his own inimitable way.